Welcome to part two of the Andy Movie Awards, filled with the major awards that people care about, and the lesser ones they sneak in between while the stars are off doing interviews and such. Don’t think of this as an overly long post stuffed with filler, think of it as 18 year end lists for the price of one! To see part one, go here. It’s that time, once again, where your’s truly breaks down who would be nominated for and win film awards if I were the only voter. As the title suggests, this is the fourth year in a row I’ve done this, with each year growing a bit bigger and more obsessive. This year, there were 39 different feature-length movies to receive Academy Award nominations, not including the Best Foreign Language category (which was made up exclusively of films that have yet to be released in North America). Of those 39, I saw 31 of them, which roughly equals 80%. The ones I missed include Operation Homecoming: Writing the Wartime Experience, Taxi to the Dark Side, and War Dance in the documentary category, as they haven’t come to my neck of the woods yet, Enchanted and August Rush in the Best Original Song category (because I don’t accept it as a legitimate category), Best Original Score nominee The Kite Runner (the only film I missed that I might have seen if I had a bit more time), Best Makeup nominee Norbit (because, well, come on), and Pirates of the Caribbean: At World’s End, nominated for Best Makeup and Visual Effects (since I haven’t seen any of the Pirates movies). In all, I’ve seen 73 feature length films that were released in North America in 2007 (see the full list here, which probably makes me a more informed voter than most of the Academy. 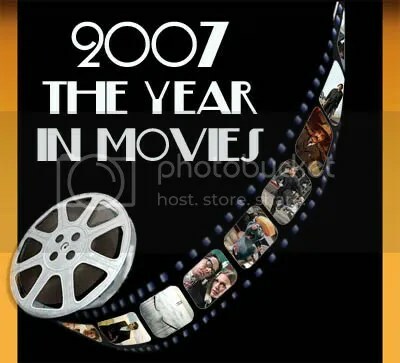 Here it is, my long awaited Top 10 Movies of 2007 list (and by “long awaited”, I’m referring to myself, as I’m not sure anyone else has been waiting for this). This is later then I usually prefer to post this list (on the principle that the later you get into the year, the less people care about the previous year), but since I added a movie to this list over the weekend, I’m glad I waited. As of right now, I’ve seen 65 different 2007 movies (for the complete list, click here), including pretty much everything I think would contend for this list. Notable movies I haven’t seen yet that could’ve contended for the list include Persepolis, Lust, Caution, and The Darjeeling Limited, but I’m really happy with the way my list looks right now, as it’s been an extremely good year for movies. As it is, I had to push some really good movies off my honourable mentions list, so I better post this before more might have to go. To give you an idea of how I felt about this year, everything on list, including honourable mentions, rated 4 stars out of 5 or higher. So if you feel like you haven’t seen a lot of good movies this year, you should give some these a try. Do you remember last year when The Onion A.V. Club posted a paragraph from my top five list in their Second Annual Film Club Poll? (It’s cool if you don’t remember, I understand). Anyway, they did the same poll this year, asking for reader submissions of lists and comments, and this year… they posted two of my comments! Three paragraphs in two years! Is that enough to start calling myself an AV Club contributor? Hmmm… maybe when I get three next year. My first paragraph on The Assassination of Jesse James by the Coward Robert Ford is on the second page, and my comment on The Bourne Ultimatum is on the third page. Now I better get on with posting my full list sometime.